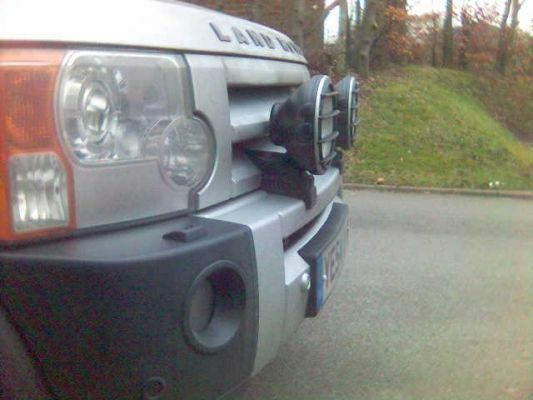 The Land Rover supplied spot lamp kit and the optional Bumper mounting kit is of generally good quality. The spot lamps come with the necessary wiring loom to connect the lamps to the fuse box, and the switch and loom to connect the lamps to the light switch. This give the driver an extra switch to the left of the instruments, which is the spot lamps master on/off. When the master is on, the spots come on with main beam, and flash with the main beam also. With the master off, they are isolated. The carâ€™s ecu will need the spot lamps feature enabling before they will work. The lamps seem to be well made, and do give a good beam. They also in my opinion enhance the front end styling of the car. The instructions are reasonably clear, but they do refer to a left hand drive car, so a few things need reversing. 3. Start at the rear, and pull the wheel arch trim off its clips, and release from the car. Retain any clips that fly off. 5. Releases the 2 clips each side by pulling them upwards (they are stiff) and remove the headlamp units. 6. Remove the front bumper. Screws are along top edge, bottom edge (behind the tow hoop cover) and under each headlamp, and at each corner; you also have to remove the Phillips screw from in the wheel arch. 7. Unclip the washer bottle to headlamp washerâ€™s connector, and the wiring plug under the right hand headlamp before lifting away. 8. Remove the battery (take care that the ignition key has been out for at least 2 minutes before disconnecting the battery) The car must be asleep! 9. Release the clips and lift the fuse tray to expose the wires underneath. Locate the grey plug. The Kit comes with full instructions and templates to connect the lamps up, and mount them to the mounting kit. The bumper mounting kit comes with its own instructions and templates. 11. Fit the Rivnuts. The instructions say use a rivnut expander, but I just wound the bolts in and tightened them up to secure the rivnut. 14. Refit the bumper and wheel arches and mud flaps. 15. You need to drill 2 x 52mm holes in the top of the bumper to align with the top of the plinths. There are templates in the kit, but please check the position carefully. An off line hole here will seriously damage the bumper! I would measure from 2 fixed points on the car, to the centre of the plinth before fitting the bumper, and then you can mark the top face of the bumper to line up the plinth accurately. 16. Fit the lamps as per instructions. 17. The kit includes 2 plastic shields to hide the hole, and the mounting bolts. I had to shave a fair amount off the shields to make them fit properly. 18. The wiring is easy. The loom from the lamps goes to the fuse box, and plugs into the spare grey plug. 19. From there it has an earth connection to fit to the â€“VE (Negative) terminal. There is a relay to plug into the socket in the loom. 20. Refit the fuse tray taking care not to trap any wires. Push the relay down the back of the fuse box to hide. 21. Clip the cable around the side of the inner wing. There is not much to clip it to on right hand drive, but a couple of cable ties should be secure. 22. In the car, you need to pull down the driverâ€™s lower dash panel â€“ just pull from the top it will release. 23. Remove the light switch panel- pull from the bottom. 26. Drill the holes as indicated, and cut the trim out. Cut the foam back, and then cut out the plastic to the template. Be careful here, do not cut the underlying plastic out further than necessary. Look at the switch mounting and familiarise yourself with the method of mounting before cutting, it is easy to misinterpret this template! 27. Run the wires as indicated in the instructions. 28. You will need to remove some pins from the headlamp switch plug; you need a very small blade to press the release clip in the plug. This is very fiddly, and it is easy to damage a plug so take care. 29. You need to remove a green plug from the bottom of the fuse box behind the lower glove box (rh drive) this is very tricky to remove. There is a retaining clip on the forward edge that you cannot get your fingers onto to release. I made a tool out of an old pair of tweezers to release the clip. GOOD LUCK this bit took me ages! There is a wire to insert into this plug. 30. Connect the loom to the switch and secure the switch and the facia plate. 31. Replace all the trim panels etc. 32. Use T4 to enable the ECU â€“ or get your dealer to do it. Useful tip for routing the cables is to have a long flexible rod to attach wires to. I used the fibreglass rod from my sons kite to draw wires through. The earthing points are on the driverâ€™s side behind the lower A post trim. The interior panels are held by small metal spring clips, which will come off. It may be a good idea to buy some replacements in advance! I am sure there is more to this, but add to this as necessary. It took me 1.5 days to do the work. Thanks Gareth! I wasn't sure about the spots with grilles and the main lights without and I'm not too keen on the headlight grilles. You've convinced me that it looks good though. Relais and fuse holder can easly fit in the box where the battery sits in. In a time of chimpanzees, I was a penguin. 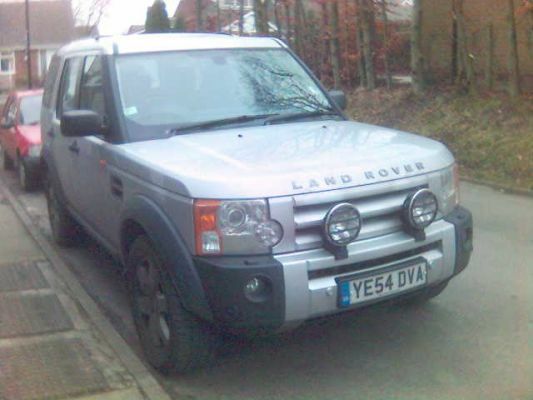 You could do that, but I preffered the Land Rover recommended way, then its covered by a warranty. That's the case in Belgium In a time of chimpanzees, I was a penguin. Not here. If they go wrong, I will take it to the dealer and ask them to fix. They are installed correctly as per Land Rovers own instructions. The dealer insisted on charging me to switch the ECU on, by doing so, and the fact that they are working now. If Land Rover did not warrant DIY installation, they would have to say so on the box surely. Any idea Gareth whether the Spot light sets you've got will fit with the Rubber A-frame (non winch version), or is there yet another version of the A-frame that has spot-light mounted on them? Not that I'm against DIY, not at all, just look out in case something goes wrong. (I'm not talking about the lights them selves, but what might they can cause, same counts for lifted air-intake, roofrack, etc etc) In a time of chimpanzees, I was a penguin. Penguin, they are approved accesories fitted with an approved fitting kit, by a competent fitter (ME). I don't forsee a problem. CC, the mountings for the rubber A frame come with the lamp kit. You only need to buy the extra mounting kit if you have no A bar. Can you post a picture of what the dash switch looks like? I (and a few others from other forums, I gather) would like to see what the dash switch looks like, as well as any other interesting installation pictures. How much did the dealer charge to activate the function in the ECU? Great stuff, shame you didnt take pic as you did it. I was thinking for getting some HUGE Hella 3000's but that sounds like loads of work and as your say no warrenty unless using the Land Rover Lamps. How much does the dealer charge to supply and fit, have you fitted uprated bulbs, e.g. 100w or even 130w ? Yes, sorry but no installation pics, I was concentrating too much on cutting holes in the right place. Dealer charged Â£49 to switch the the ecu on. Will take a pic of the dash switch when when I get home at the weekend.